Walking tour of Downtown LA. 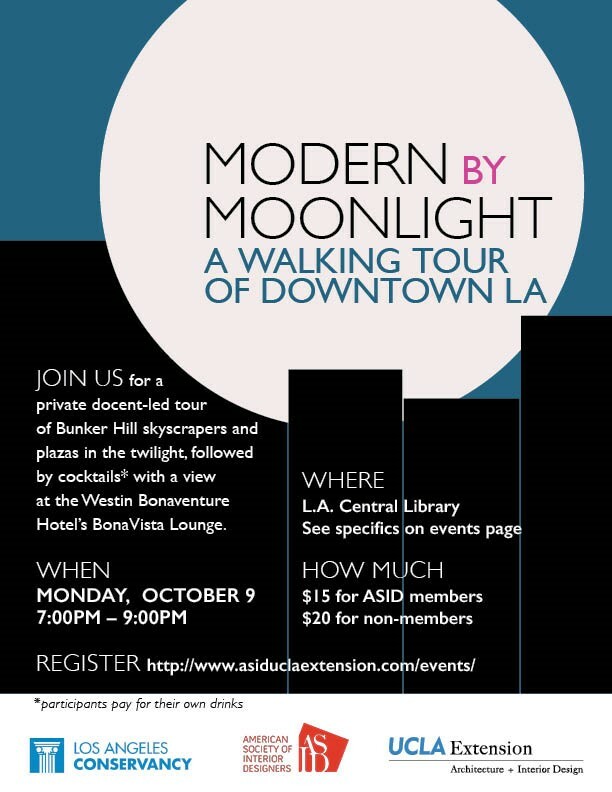 Wonderful event this coming Monday, October 9. 7-9 PM. 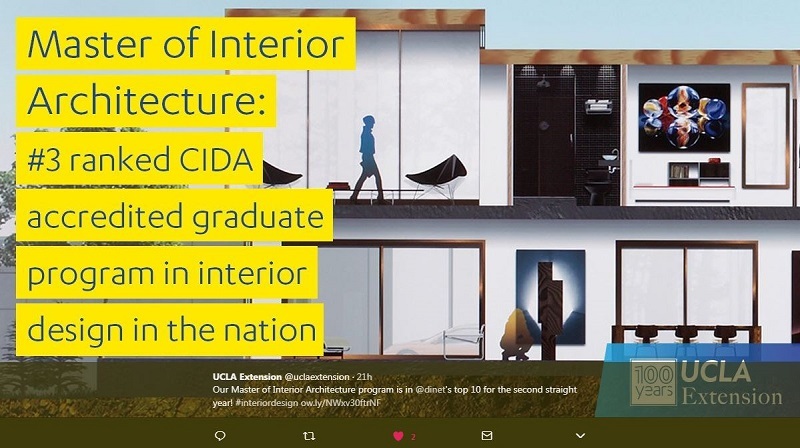 We are pleased to report that for the second year in a row the Master of Interior Architecture program has been ranked by Design Intelligence in the Top 10 Graduate Programs in the Nation. 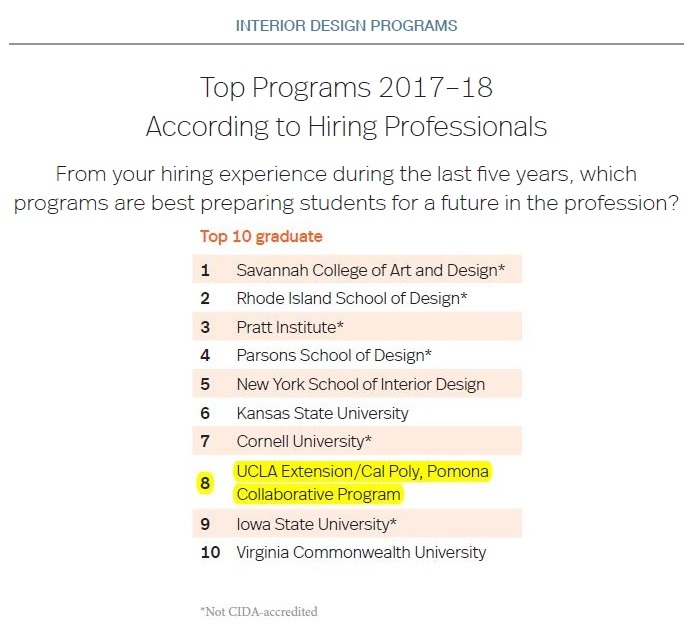 We moved up to position #3 CIDA Ranked. Thank you for your continued support of our terrific program! 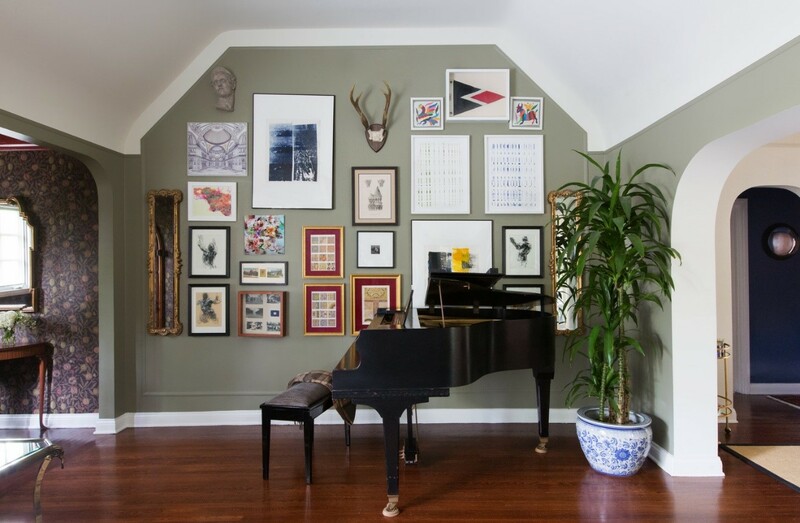 I am pleased to announce that one of our past Masters of Interior Architecture students residential projects has been published in the Home Tours section of The Los Angeles Times. 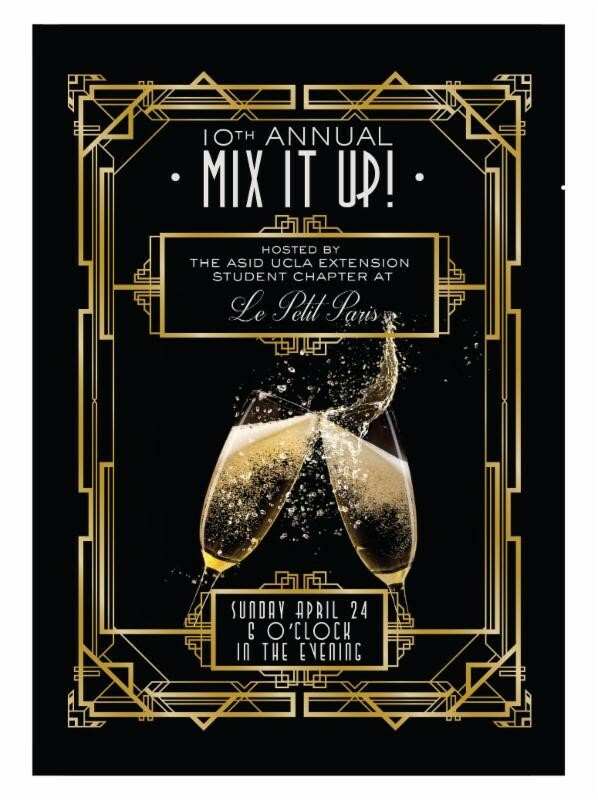 ASID UCLA Extension Presents Its 10th Annual Mix It Up! Don’t miss out on the biggest night of the year! Join the ASID UCLA Extension Student Chapter in celebrating a decade of coming together at the annual Mix-It-Up! Step into the glamorous era of the Roaring 20’s in the breathtaking Art Deco mezzanine of Le Petit Paris for an unforgettable evening of glamour and cutting-edge design! Take this wonderful spring evening off to mingle with fellow students, UCLA faculty, industry partners, and professional interior designers while you enjoy complimentary appetizers, and sip on beverages from the cash bar. Mix It Up! is more than just a glamorous night – it’s where design and philanthropy collide. It takes as little as $1 to enter to win custom furnishings, accessories, gift certificates, free classes and much more! Proceeds of the event support the PATH Gramercy Center, a shelter for homeless and low-income families, especially young single-parent families in Los Angeles. THEME: Roaring 20’s – think Great Gatsby cocktail attire! LOCATION: In downtown’s historic core, Let Petit Paris is housed in the former El Dorado Hotel (originally built in 1913), a stunning space by New Theme features two bars, a mezzanine level, outdoor patio, and main dining room. During the evenings, the upstairs will turn into a DJ-tuned lounge space that’ll be perfect for mingling. Tickets for this event sell out every year, so don’t wait! Purchase your ticket today! Arc+ID Open House happening Thursday, April 28th! 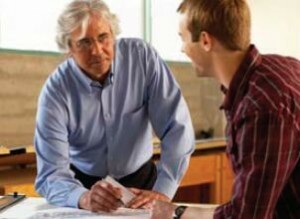 Have you or someone you know been considering a career in interior design? There’s no better time to get started on your goals than right now! Join us this on Thursday, April 28th for a free informational overview of the Architecture & Interior Design program. …Followed by a Q&A session with the whole panel! Attending our Open House has many perks for new students. Not only will be raffling off a FREE CLASS, new students can take advantage of the NEW STUDENT DISCOUNT: Students who are new to our program are eligible to receive 15% off select Summer 2016 classes when they enroll at the Open House. Click here or on the image below for more information and to RSVP online. Want to participate in the 2016 UCLA Extension Certificate Graduation Ceremony? Make sure to Opt-In before April 15! Save the date! UCLA Extension’s Certificate Graduation Ceremony will be held on Friday, June 24, 2016 at Royce Hall. If you are planning to participate in the ceremony, you must first make sure you are eligible to graduate. Eligible students must have completed their certificate between Fall 2015 and Summer 2016. If you are unsure if you are eligible, contact the program department at arc_id@uclaextension.edu. Once you’ve verified your eligibility, visit My Extension to opt-in to participate in the graduation ceremony. The deadline to opt-in is April 15, 2016! An official e-invitation to the Graduation Ceremony will be sent out in mid-May to those who have opted-in by this deadline. More information about graduation will be posted soon! 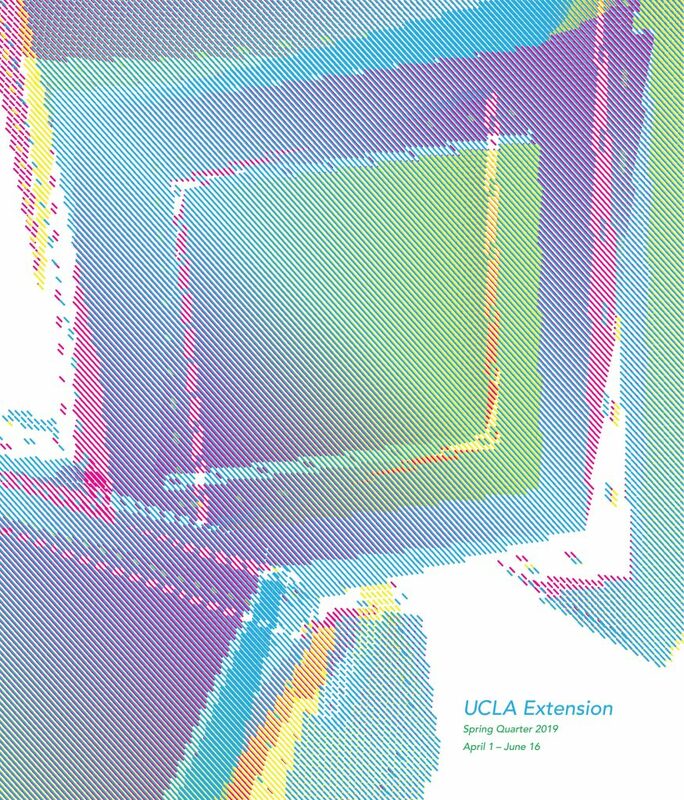 In the mean time, check out the official UCLA Extension Certificate Graduation website. Questions? 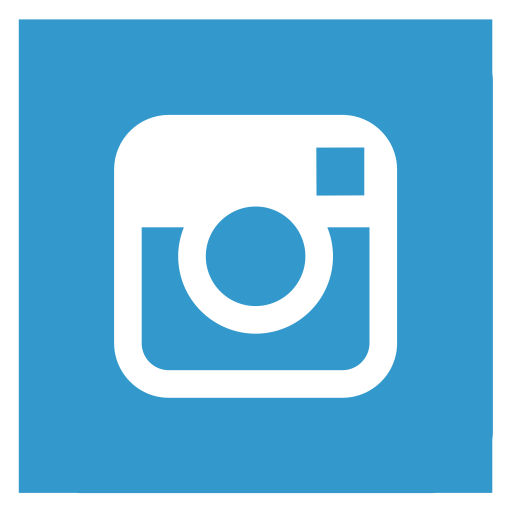 Email graduation@uclaextension.edu or call (310) 825-2674.